When you think of the ultimate survival gun you should think of a simple pump action 12 gauge. No other gun provides the level of versatility, durability, and power more than a proven 12 gauge. The reason of this versatility and diversity is the range of 12 Gauge shotshells available which ranges from wild to mild. Available shotshells run the gamut from sabot’ed slugs capable of downing any North American game accuratly, fletched long range defensive rounds, door breaching rounds, signal flares, heavy goose and turkey loads, light recoiling clays loads, to the standard variety of buckshoot, BB, pellets, and many more. 12 Gauge shot shells are also among the easiest and most forgiving rounds to reload and can be even reloaded with black powder. If you were faced with having only one gun for survival, any survival expert will tell you that a 12 gauge will serve you better than any other firearm. This was the thinking behind the Mossberg JIC - Just In Case series. 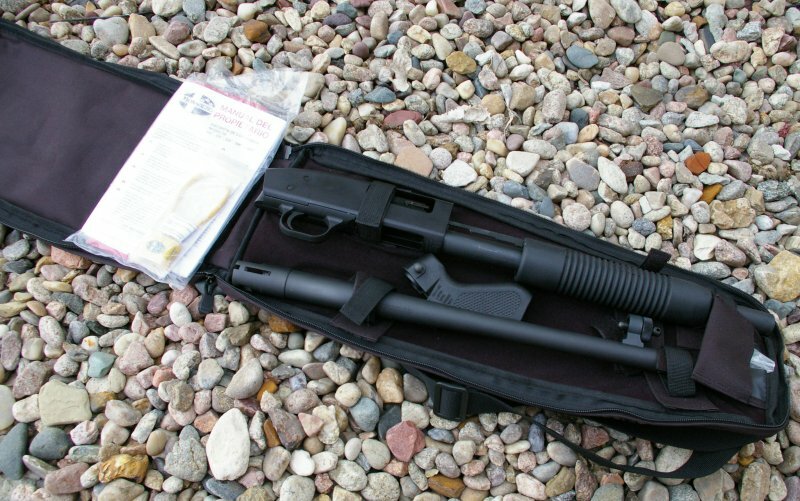 The series features Mossberg’s 500 series shotguns originally packaged in waterproof, floating, bury-able tubes which provided protection and legal stowage. The newer JIC II series takes the concept a step further with a simple cordura pack based carry solution. The JIC II version is packaged in a more user friendly format than the giant tubes on the previous models. Mossberg found that people loved the ready-to-shoot concept of the original JIC watertight tube where bulk was not a problem and case durability was paramount, but customers were also asking for a smaller compact more discreet soft cased version as well. 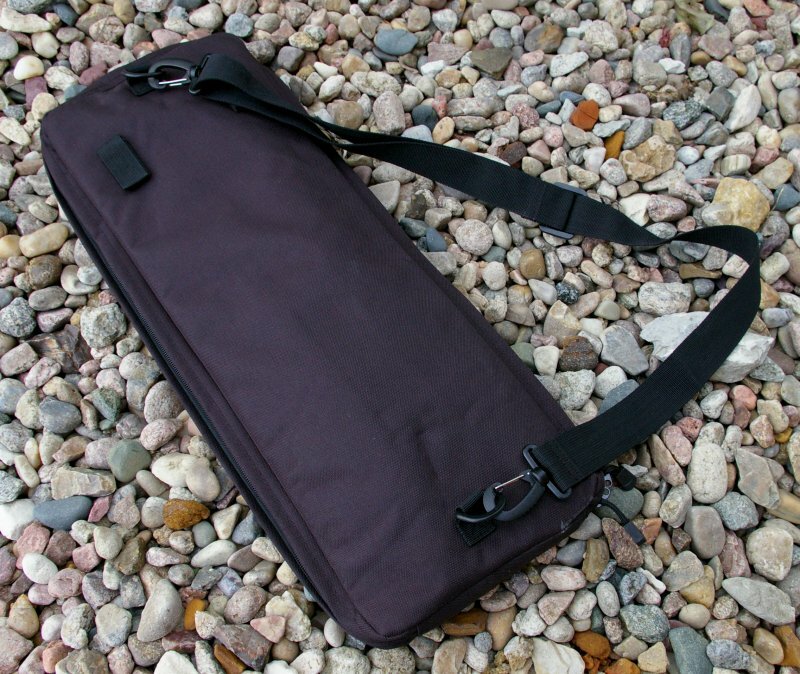 Mossberg worked with 5.11 (one of the top tactical clothing and accessories manufacturers) to come up with a simple shotgun case design which was durable, light, and as small as possible. The result was the Cordura JIC II case made by 5.11 which holds the Mossberg 500 in disassembled state, assembly tools, gun lock, and provides plenty of room for your ammo. What makes this and the other JIC kits cool, convenient, and unique is a compact shotgun and storage solution wrapped into one. Generally shotguns come in a cardboard box, are stored and carried in long gun looking cases, and are fairly large and not so “packable”. On the other hand, the insanely popular Mossberg 500 series Cruiser shotgun featuring a pistol grip and 18.5” barrel reduces the overall size of your average Mossberg shotgun to just under 29”. This makes the shotgun lighter, smaller, and pack-ably manageable. 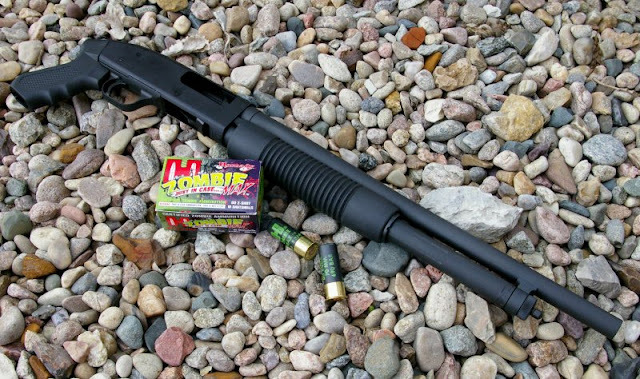 Mossberg took that hot selling Cruiser 6-shot shotgun and packaged it originally into a JIC PVC type tube and later the JIC II with soft cordura case. Neither of these cases look like shotgun cases, with the exception of the not-so-covert giant white and red JIC II logo, and make these guns small and easy to take along wherever you go “Just in Case” you need a shotgun. Mossberg was clever enough to package the case and shotgun together in a convenience high quality package. From a features perspective, I was a little confused when my Mossberg JIC II arrived, as it differed a bit from the pictures I ordered from and even from Mossberg’s own website. In fact Mossberg’s website has a picture of it topping the JIC series page, but none of the description, feature or specification information is provided on the JIC II and lacks even MSRP information. This is surprising considering this model is nothing new, however it has clearly been a bit forgotten during the site update process. The end result was that all the pictures show a model a bit different than what I received. Mossberg’s picture shows an included sling and attached loop forend sling, but the received model included neither which was a bit of a bummer. 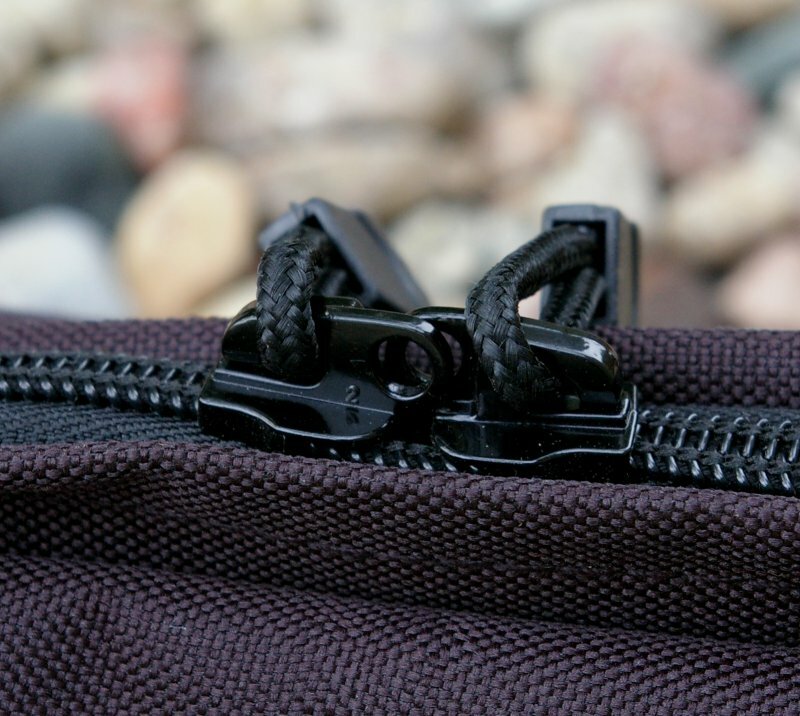 The case itself is designed to hold the barrel, action, and pistol grip securely via Velcro straps in disassembled state, and provides a pocket for the take-down pistol grip bolt, washer and hex wrench. 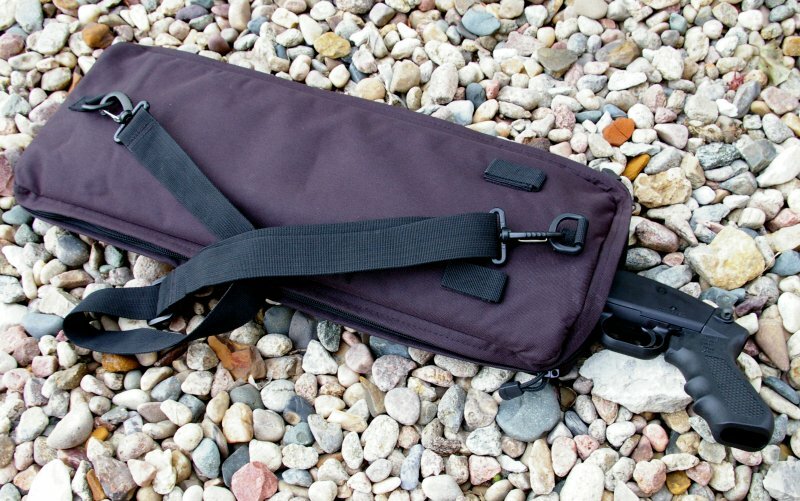 With the case packed, it measures a very compact 22”x9”x2” which can be easily slipped under a seat, secured to a pack via the rear Velcro loops, or carried via the included case strap. The disassembled action with the pistol grip removed just barely fits in the pack, which indicates to me that Mossberg was making every effort to reduce carried size. 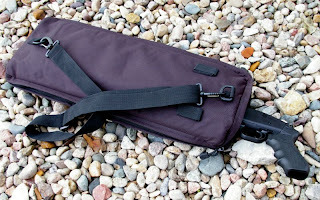 A simple single adjustable strap is provided to carry the case comfortably slung over a shoulder. 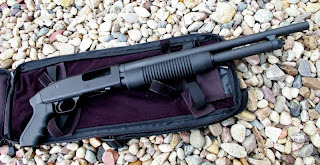 The kit includes the famous 12 Gauge Mossberg 500 which should at this point need no review, however for those that are not familiar with this slick cycling shotgun, it features twin action bars for positive functioning, 5+1 shot capacity (with 2-3/4” shells), 18.5” barrel, pistol grip, and sling swivel studs. The shotgun can handle up to 3” magnum shells if you dare, and is finished with matte phosphated finish. This version of the 500 series cruiser is the less frilly version than some of the Blackwater or alien warlord looking versions with giant compensators Mossberg now makes; this version is tipped only a simple bead sight. Ergonomically, the Mossberg 500’s differ from other brands with the position of the safety and slide release. The slide release is next to the thumb versus the forward of trigger guard location and the safety is thumb operated tang mounted for ambidexterous use, versus being located behind the trigger guard. The receiver is made of mil-spec aluminum and features a polymer trigger guard. It may not be fancy, but the 500 series is light, simple to use and is a proven design which just works every single time. Assembly is pretty quick and very simple. Unzip the full length, lockable zippers to fully open the case, un-velcro the receiver, barrel and pistol grip, and remove the grip’s bolt, washer, and hex wrench from the little internal pocket. Press the slide release and move the action to half open and insert the barrel and then tighten the thumbscrew about seven turns until tight to secure the barrel. install the pistol grip with the included bolt, washer, and hex wrench and the shotgun is ready to shoot. In total you can have the entire shotgun together in about a minute. Pump shotguns all work about the same way; load shells by pushing them into the magazine, press the slide release, rack the action to chamber the first round and release the safety if necessary to shoot. Once a round is fired, the slide action automatically unlocks and the shooter can rack the action again to shoot again and again. It could not be more simple, I am sure most trained monkeys could operate a 12 gauge pump shotgun and that’s one reason it is the ultimate survival firearm. The pistol grip version has its sizing, maneuverability, and weight advantages, and for shoot from the hip or waist close range shots, the pistol grip even mitigates a fair amount of recoil. The pistol grip, however does take a little practice for accurate shots and while managing the recoil at eye level. Shooters need to assure a safe recoil zone is maintained for eye level shooting or you may find the backside of your fist smacking you in the face. Recoil is a bit of a problem for me in general. I have loose rotator cups and steel plates in my arm which typically makes my arm feel like it has been hit with a hammer each time I shoot high recoil firearms and if shot with a stock the wrong placement on my shoulder requires a rather painful joint reset and loud pop. Generally I gravitate toward autoloading shotguns for that reason. That said, shooting the JIC II Cruiser shotgun was a bit tingly in my arm but fun and manageable for both hip and line of sight shooting. For new shooters, shotgun recoil takes a while to adjust to which just takes practice. I was pretty impressed that even with Hornady Zombie Max 00 Buckshot loads at 25 yardsI was able to easily destroy a 20oz Coke bottle with eye level shots over and over again. These rounds usually group in the 2-3” range at that distance so a fair amount of accuracy was required. Turkey loads make it easy to hit just about anything at 25 yards with the permanent Improved Cylinder choke of this barrel. My prefered shooting grip was a solid two hand pistol grip when shooting for accuracy off hand. For less stationary defensive shots I used a pushing forend grip and pulling trigger hand grip to manage recoil. Dropping the shotgun down on the bench, I found it pretty easy to keep all my slugs in a 2”-3” circle at 25-yards, however to be honest 6-rounds of slugs and I decided that I was done with that experiment. For my steel lined bones, slugs induced Tourette’s syndrome like outbursts and for me were harsh to shoot, however slugs always are a bit brutal in any pump action. Thankfully Mossberg did not adorn the JIC II case also with the household name of “Mossberg” otherwise it would be obvious what the case carried. 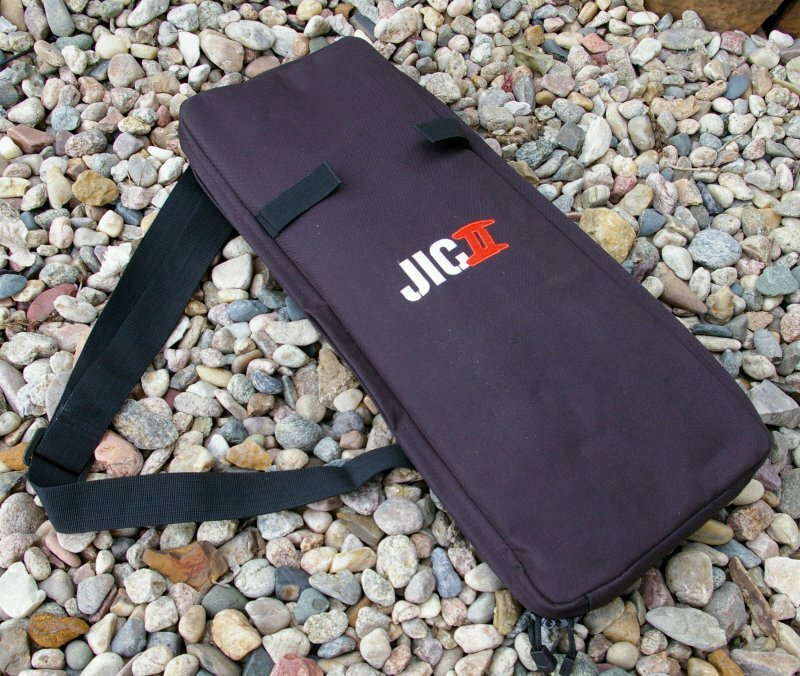 The prominent JIC II logo can be clandestinely recolored with a black sharpie or by removing the stitching for those who require a more subdued case look. I was a little disappointed that the JIC II did not come as pictured with the sling and looped forend strap, because at the very least a buyer now needs to pick up a sling for safe carry of the shotgun. 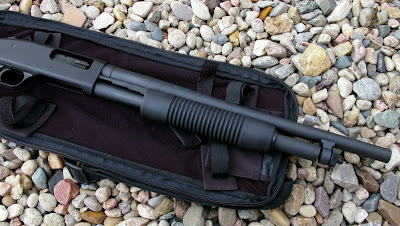 If I had a wish list, I would want some type of open top pocket in or on the case which could be used as a scabbard for the shotgun in assembled state and a flip up case extension which would allow the shotgun to be carried cased in fully assembled state. This is a handy shotgun which could easily pull home defense duty at night and get tossed into the trunk during the trip to work, “Just in Case”, and it would be nice to not need to fully disassemble the shotgun every time. Regardless of those wants, this is a compact little kit that goes together quickly and takes up very little room and provide all the functionality of the well refined and time tested Mossberg 500 action. Slip a 50-round shot shell bandolier sling into the case with a variety of buckshot, slug, bird shot, flare, and BB rounds and you can cover about any need which may arise. The 12 guage shotgun, is the ultimate survival firearm, great for home defense, and hunting and for $350 or less on the street, the shotgun remains one of the best deals in firearms. The JIC II kit just makes it that much easier to take a great shotgun along, you know... “Just in Case”.